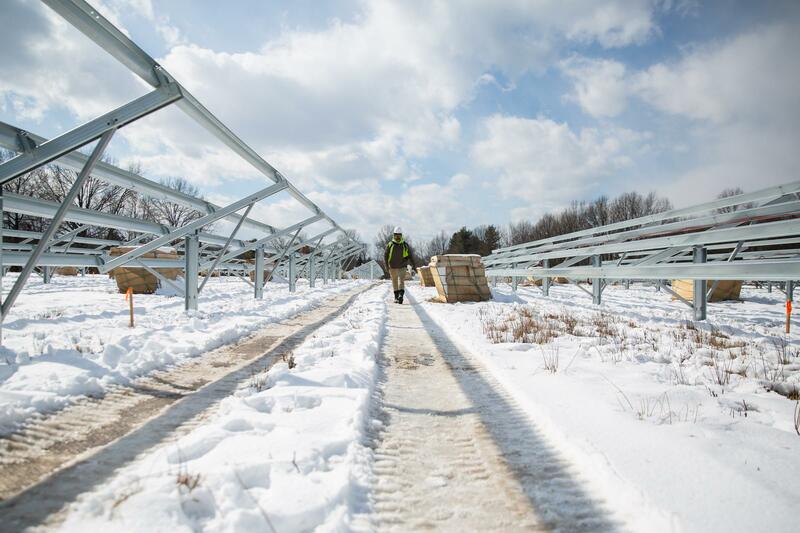 Bloomfield is hosting one of three pilot projects anticipated to test the community solar idea in Connecticut. But with shared solar, you don’t need all that. You can sign up for an array that’s located somewhere else. Think of it like a community garden for energy. Most of the power produced in Bloomfield will benefit the town’s taxpayers. But you don’t have to be a local customer to take part. Another portion will benefit public housing in Stratford. And state residential customers can participate, too -- as long as they’re in the same utility service area as the array. 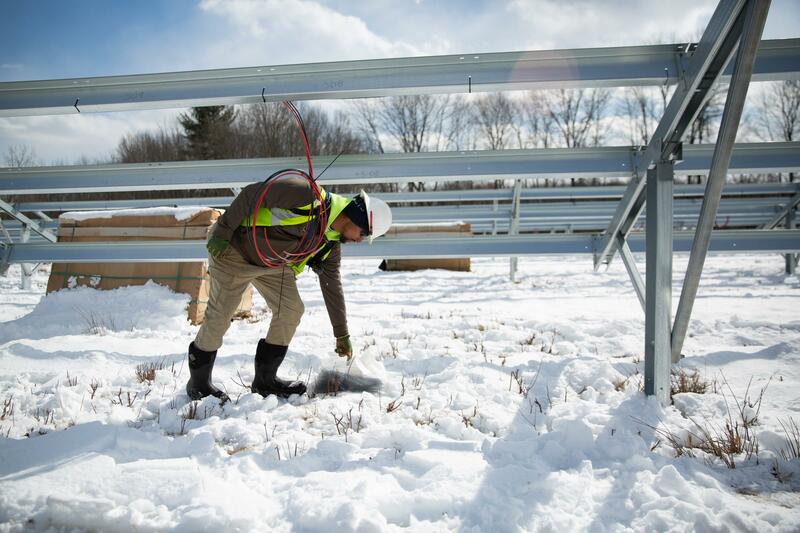 Nick Sone is one of around 30 workers who are helping to build what's on track to be Connecticut's first community solar array in Bloomfield. In New England, Massachusetts has offered shared solar incentives as far back as 2014. And so far, it’s brought online enough energy to annually power nearly 50,000 homes. But setting all that up? It’s complicated, said Michael Judge, with the Massachusetts Department of Energy Resources. “There [are] a lot of different dynamics when it comes to how solar ‘costs and benefits’ show up on an electric rate payer’s bill,” Judge said. Judge said if you subscribe to a community solar array, one benefit is simple: you get a credit on your power bill. “And by providing you those credits, they would reduce your electric bill,” Judge said. But what if you don’t subscribe? Well, this is where it gets tricky. Joseph Rosenthal, an attorney with the Connecticut Office of Consumer Counsel, said there is a cost. “The design of the pilot was the general class of ratepayers pay everything. The subscribers are the ones who get the credit,” Rosenthal said. That’s because when a community solar developer contracts with a utility, it often agrees to sell it power at a fixed rate. One that’s typically higher than the cost of getting electricity from bigger grid-scale solar projects. So ratepayers across the utility’s service area all pick up that additional cost, according to an analysis from the Department of Energy and Environmental Protection. But only subscribers get the credit on their bill. “Now there are other benefits that go to the general class of ratepayers. Cleaner air. Producing power during the peak - maybe lowering the peak power price and so forth,” Rosenthal said. But still, there’s that tab. Other programs have offset the extra costs of community solar by charging subscribers to sign up. But Lauren Savidge with the Department of Energy and Environmental Protection, said that wouldn’t work for the pilot study. The idea was to get as many people participating as possible. “One big policy behind shared solar, especially looking at the low income community, is to limit barriers to participation,” Savidge said. Savidge said the state is now working to bring more shared clean energy online. Last session legislators approved another 150 megawatts of shared power, from solar, fuel cells, wind, and hydro. But building all that will likely take years. And that same legislation also included other language that could discourage people from putting rooftop solar on their homes. Nick Sone walks between panel frames at the Bloomfield array. Workers at CTEC Solar are optimistic this pilot program will show the value of shared, community-driven solar. Back at the muddy solar array in Bloomfield, Mike Ricci with CTEC Solar said when this pilot project comes online in the spring, he’s hopeful it will prove community solar’s worth. “That it can benefit the town of Bloomfield to the point where the state of Connecticut will see how valuable community solar really is -- and that will promote them to incentivize that more,” Ricci said. And for this project at least, it looks like demand is there. Bloomfield’s community solar array isn’t even fully built yet, but it’s already almost fully subscribed. Connecticut’s only nuclear plant has won a bid to provide customers with electricity over the next decade. The award comes at a time when offshore wind and solar energy continue to grow.